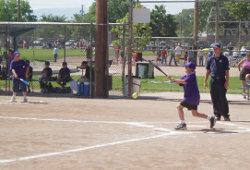 Information about City-organized softball activities in Albuquerque. For the latest information about weather and games, call (505) 768-GAME or follow @CABQRecreation on Twitter. Must be at least 18 yrs. old and USSSA sanction required. Softball is a great way to exercise, enjoy the outdoors, make friends, and have fun. Join a softball team today! Important information and dates for Albuquerque softball leagues. All teams must pay a sanction fee of $50. To register your team, contact us. View Albuquerque softball field locations.